A decadent truffle with an adult twist! 1. In a large mixing bowl beat butter, vanilla, and salt. Slowly beat in sweetened condensed milk. 2. Stir in prepared pecans (soak pecans in bourbon for several hours for optimal taste), bourbon and 1 lb. powdered sugar; mix well. 3. Form mixture into 1″ sized balls; roll each ball in remaining powdered sugar. Refrigerate bourbon balls for approximately 30 minutes or until firm. 4. Melt CANDIQUIK® Coating in Melt & Make™ Microwaveable Tray according to directions on package. 5. 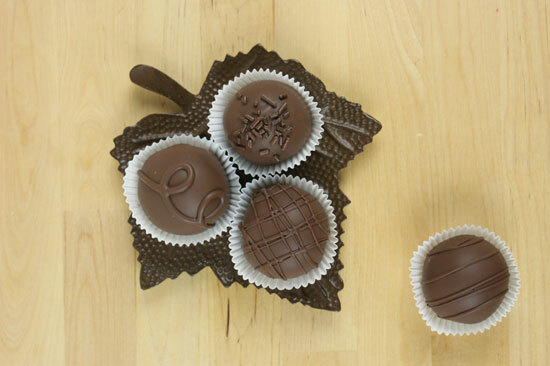 Dip bourbon balls in CANDIQUIK® Coating and place on wax paper to set.